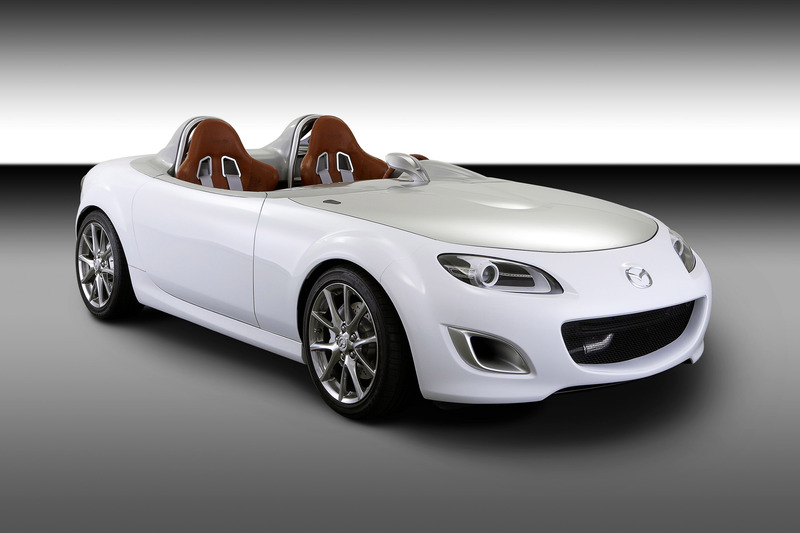 Mazda MX-5 Superlight Concept is an answer to the world of automobiles and individual mobility moving towards energy efficiency, environmental compatibility and uncompromised safety - along with dynamic attributes and driving fun. In its efforts to offer pure driving enjoyment, while meeting its ecological and social responsibilities, Mazda has been focusing on weight reduction as a core base technology. For 20 years, reducing weight has been a tradition with the Mazda MX-5. It provided the inspiration for the radical design of Mazda's latest show car and its radical interpretation of the cult roadster. 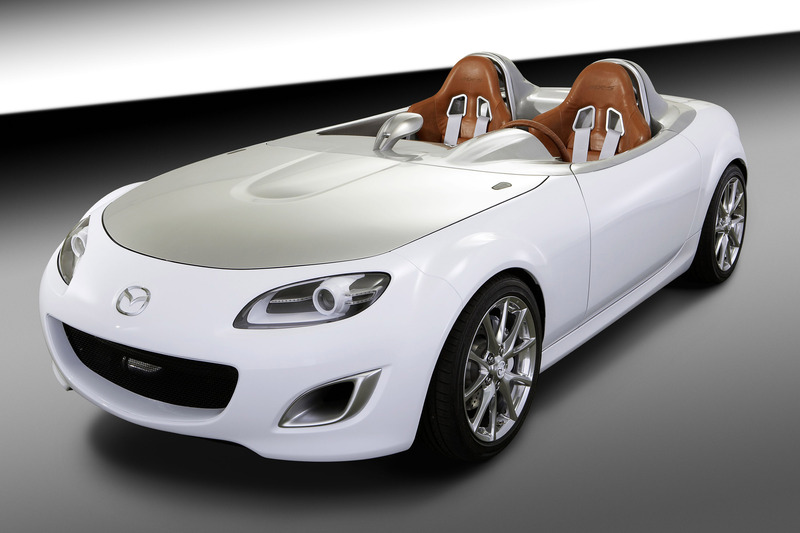 This year Mazda celebrates the 20th anniversary of the first Mazda MX-5 roadster, which laid the cornerstone for its Zoom-Zoom brand philosophy - reason enough for Mazda designers to create a fully-drivable show car, the Mazda MX-5 Superlight Concept. There are no plans to build this car, but it demonstrates how individual mobility can be maintained in a way that uses fewer natural resources. 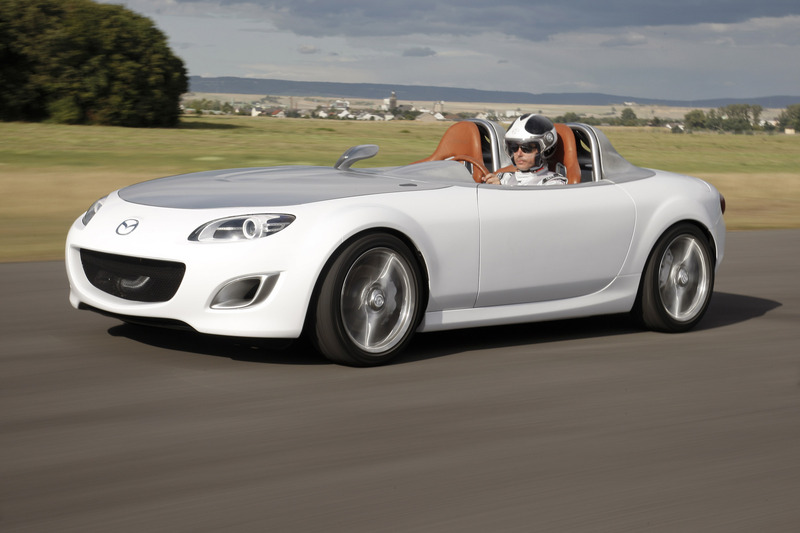 Mazda's European R+D centre in Oberursel has created a show car that represents the essence of Mazda's fun-to-drive aspect. 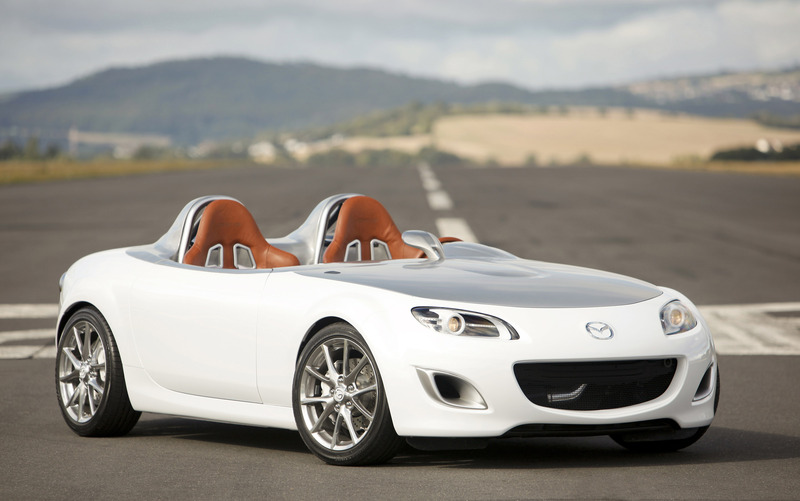 Based on the brand icon Mazda MX-5 Roadster, the Mazda MX-5 Superlight Concept is a pure, uncompromising two-seat sports car meant to be affordable to just about anyone. The main challenge for the design team in creating this roadster was "to evolve the MX-5, developed to perfection during the last 20 years, to a higher and extreme level," says Project Lead Designer Hasip Girgin. The result of their efforts is a roadster show car with an exciting design that is especially lightweight and distilled down to the very basics of sporty driving, that still manages to provide modern safety technologies. In an increasingly digitalized world, it creates a linear, direct bond between man and machine. Its conceptual purity means even better driving dynamics and fuel efficiency, which is accomplished by keeping the vehicle below the 1000 kg threshold. 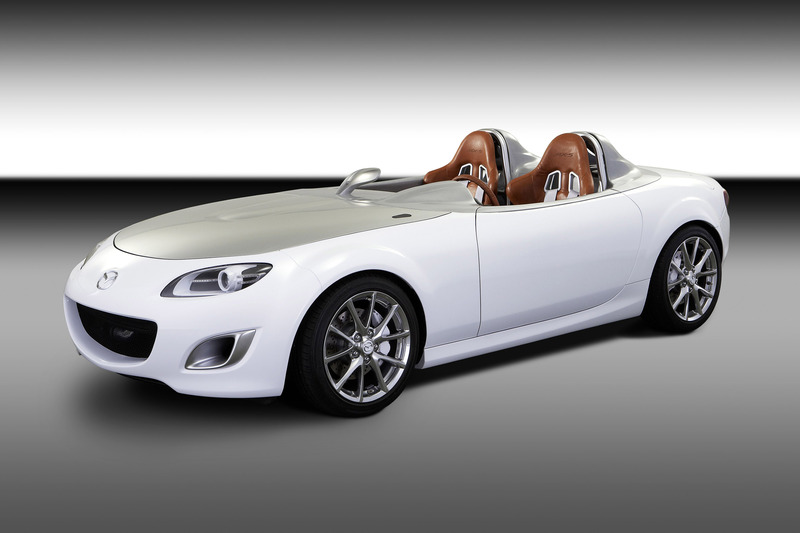 As a show car for lightweight construction and driving enjoyment, the Mazda MX-5 Superlight Concept is the ideal ambassador for Mazda's brand values. "I've dreamed of building a Mazda MX-5 with this kind of radical form for a long time," says Peter Birtwhistle, Mazda Motor Europe's Chief Designer, referring to the project. "Now that weight reduction has become a dominant factor in automotive development, the time is ripe for it. We show how lightweight a car today can be." 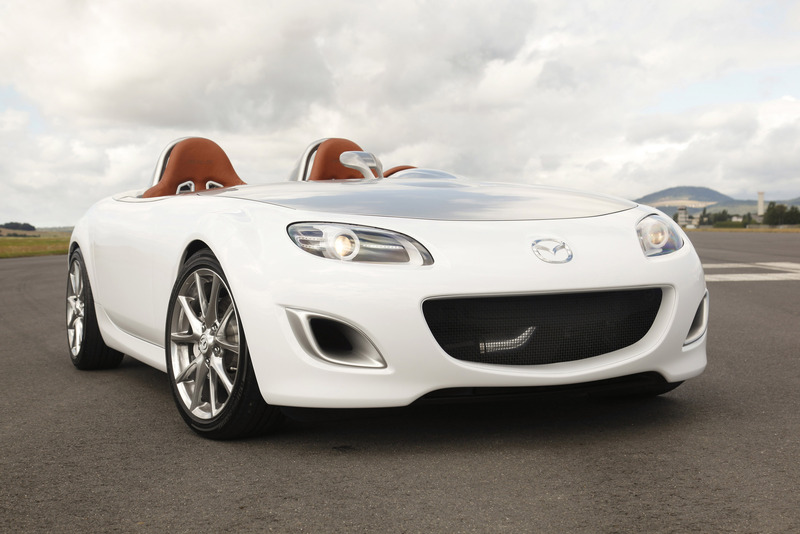 His design team reduced the MX-5 down to its core attributes to create a pure roadster. Development of the production model MX-5 focussed on the bond between driver and co-pilot to the roadster, the car's driving dynamics and its open-top experience. 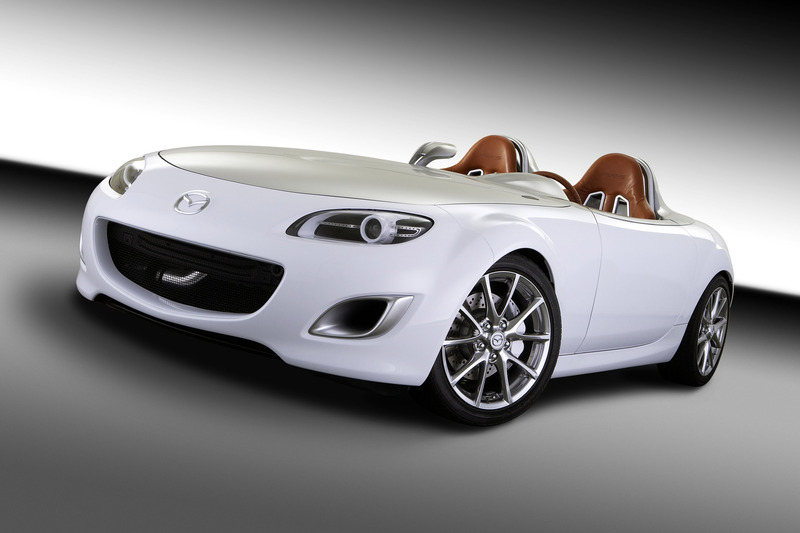 The goal of the Mazda MX-5 Superlight Concept was to strengthen these bonds even further. By doing this without a windshield, the retractable top and its frame, designers achieved an important step in this direction. 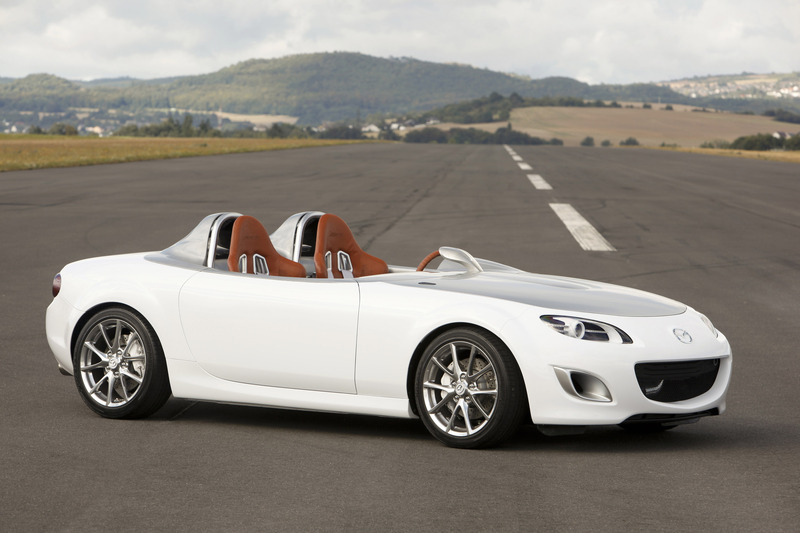 As the Mazda MX-5 Superlight Concept, the allweather production roadster has mutated into a driving machine that lets sports car enthusiasts enjoy the natural surroundings unfiltered and tangible. Not only does the wind blow unimpeded during driving, pilot and co-pilot can also experience the sounds, smells and temperature changes of their immediate surroundings. And finally, the show car's intense bond between the driver and the technology of the vehicle gives it a unique closeness that can only be found in stronger form in the cockpit of a race car. Mazda designers created special roll-over bars, not only because they are very sporty-looking, but also to contribute to aerodynamic efficiency. These also make it clear that roll-over protection is important in this concept. And they prevent wind turbulence around the heads of the passengers, from whom the law would require the wearing of helmets while driving. 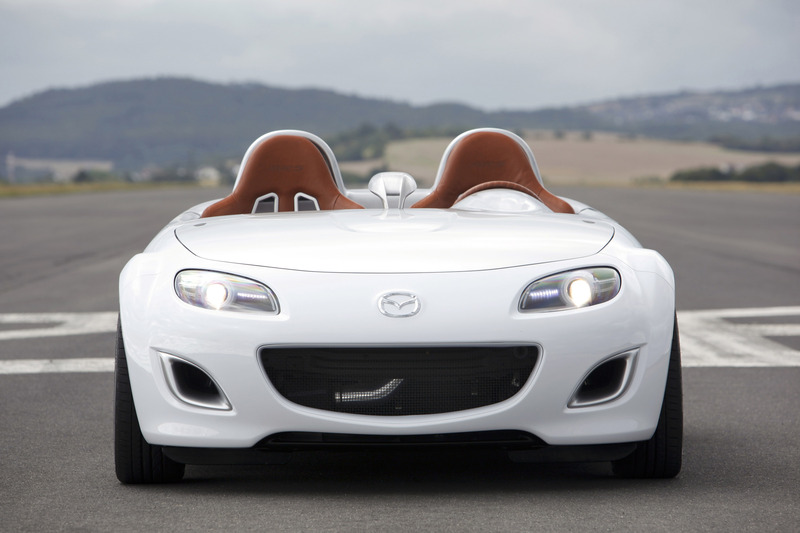 By removing equipment not vital to driving, and by replacing vital things with components that support the unique concept of the vehicle, designers sharpened the character of the Mazda MX-5 Superlight Concept. Because there is no windshield, for instance, there is obviously no need for wipers. The roadster show car's completely open design makes the need for outer door handles, side windows and their openers unnecessary. A single, filigree aluminium, wide-angle mirror gives a good view of the road behind. It's placed inside an extension of the bonnet. Front and rear lights are the same as those of the production model with additional LED lamps at the front, and brake lights at the back of each roll-over bar, which contribute to the roadster's sporty look. The lack of a windshield required an extension of the original aluminium bonnet into the cabin. The attached sheet here is made of lightweight carbon fibre and provides a hood for the dashboard frame. This also changed the proportions of the body's design, making the front of the car longer and the passengers seem like they are sitting further back towards the rear-drive axle, all of which is enhanced by the massive roll-over bars and their aerodynamic cladding. 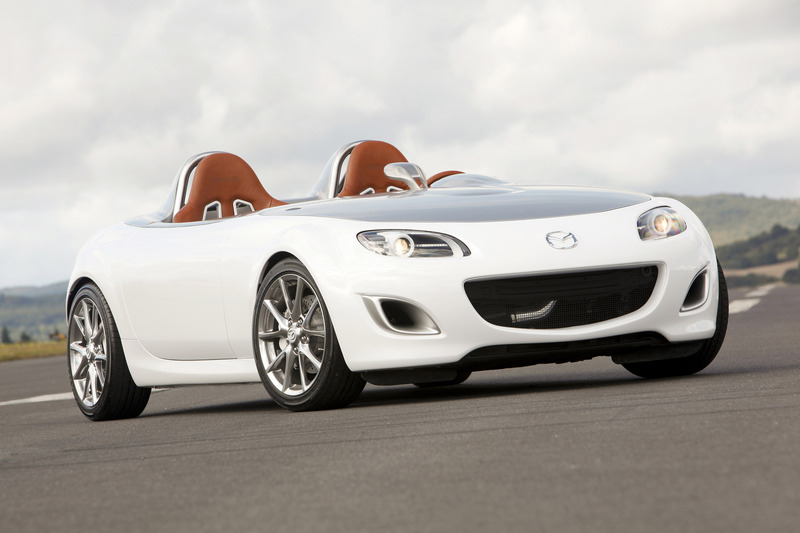 The Mazda MX-5 Superlight Concept translates the dramatic proportions of historical race cars into a very modern form. The purity in design of the exterior also characterizes the interior design, which does not have aesthetics as ultimate goal, but was conceived to contribute to reducing vehicle weight. Driver and passenger of the Mazda MX-5 Superlight Concept are greeted by racing bucket seats made of ultra-lightweight carbon fibre. They are slide adjustable and upholstered with the same saddle coloured leather as the armrests, the steering wheel, and the lightweight aluminium shift lever and hand brake. Colour-coordinated four-point seatbelts hold the driver and passenger firmly in their seats. 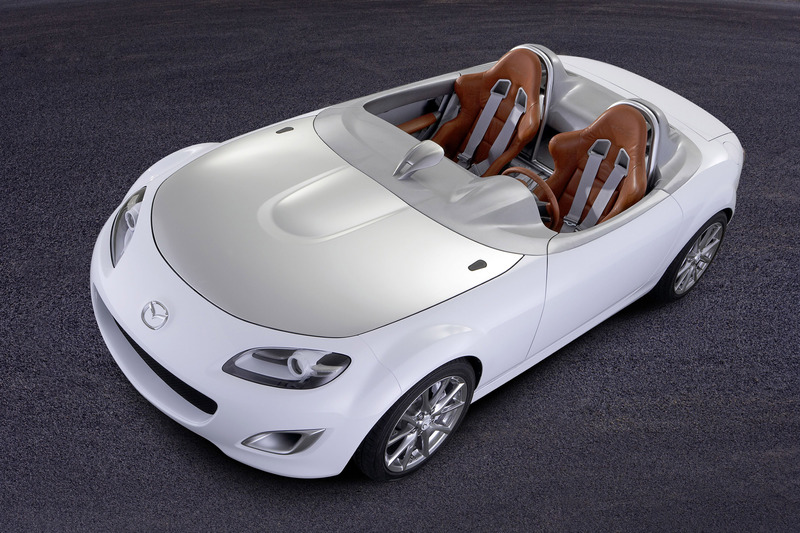 The bonnet extension into the passenger cell provides a canopy for the dashboard, which makes the dashboard look smaller than the production Mazda MX-5. 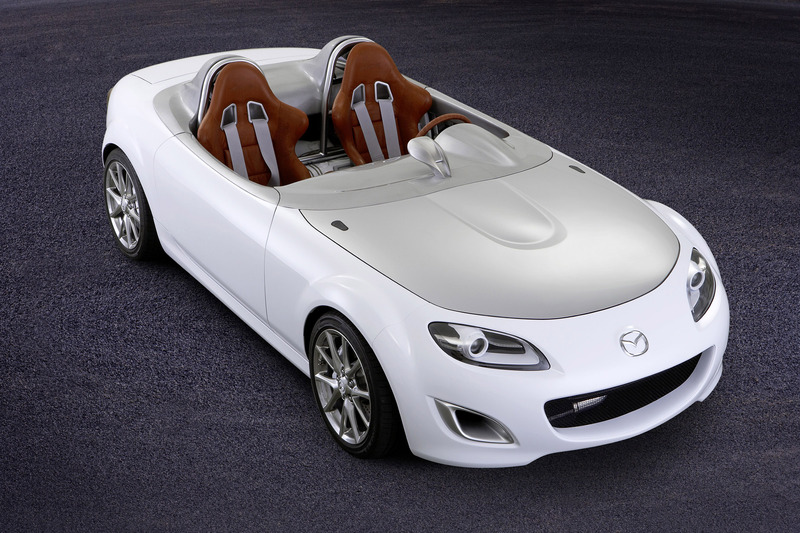 Made of lightweight plastic reinforced with fibreglass, it contains the same instruments as the production Mazda MX-5. These are held in place by a dashboard frame made of lightweight carbon fibre. Like a purebred race car, the Mazda MX-5 Superlight Concept has an ignition button in the centre of the dashboard, along with two emergency kill buttons for immediate fuel and electricity cut-off. Supplying air and climate control to the open passenger compartment is only possible in limited form, so the show car has no air conditioning and no fans. Air-flow is increased when the roadster accelerates, and only small air vents are needed. The interior is made without any trim. Sound insulation mats and rugs do not meet the requirements of a purist roadster like this and are not used at all. Also made of ultra-lightweight carbon fibre is the "floating-design" centre console with iPod® adaptor and the triangular reinforcements in the trimless doors. Driver and passenger can rest their arms here while driving. 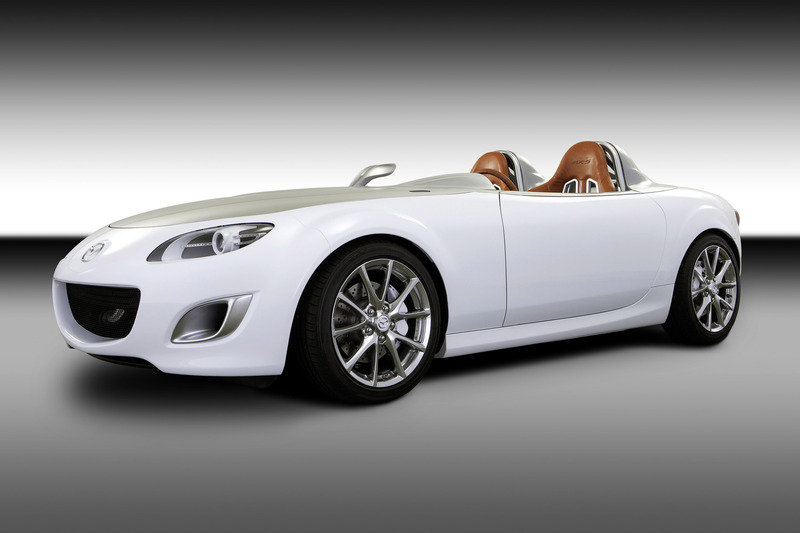 The Mazda MX-5 Superlight Concept is fully-drivable, but there are no plans to produce it in the near future. Under the bonnet is the cultivated and frugal MZR 1.8-litre four-cylinder engine paired to the production roadster's five-speed manual transmission. It develops 93 kW/126 PS of maximum power at 6,500 rpm. For an appealing engine sound, there's a Mazdaspeed cold-air intake made of polished and powder-coated aluminium and a Mazdaspeed exhaust system, both of them specific to the Mazda MX-5 Superlight Concept. These systems deliver more intake air-flow, and less exhaust-gas back pressure. The engine sound is designed to suggest an engine with much higher displacement than the concept actually has. During charge cycles, a high-resonance bubbling sound in the muffler delivers the exciting sporty sound you expect from a very powerful engine. The show car is designed to provide improved driving dynamics as well, and uses a four-piston, fixedcalliper brake system with perforated discs that, because of their size required an increase in track of 50 mm. A specially tuned chassis with a Bilstein® B16 coil-over suspension and Eibach® stabilisers give the body of the Mazda MX-5 Superlight Concept a ground clearance that is 30 mm lower than the production Mazda MX-5. Its sporty hydraulic power-assisted rack and pinion steering system is the same as that of the regular roadster. Its linear steering, coupled to a precise-shifting five-speed manual transmission with short shift travel, have contributed to the character of the world's most successful roadster for years. Also from the production model are the roadster's 205/45 R17 original-equipment tyres and alloy wheels from the 2.0-litre version, which are some of the lightest on the market today at less than 8 kg.